Blessed John Neumann, C.SS.R.--Pastoral Bishop | Michael J. Curley C.SS.R. John Nepomucene Neumann was born in Bohemia. While in the seminary he felt a desire to help in the American missions. After coming to the United States he was ordained in New York in 1836. Entering the Congregation of the Most Holy Redeemer, he worked in establishing parishes and parish schools. In 1852 he was consecrated Bishop of Philadelphia and prescribed the Forty Hours devotion. According to the 1962 Missal of St. John XXIII the Extraordinary Form of the Roman Rite, today is the feast of St. Telesphorus, pope and martyr. According to St. Irenaeus, St. Telesphorus, who governed the Church from 126 to 136 during a period of violent persecution, suffered martyrdom for the faith. John Neumann was born in Bohemia on March 20, 1811. Since he had a great desire to dedicate himself to the American missions, he came to the United States as a cleric and was ordained in New York in 1836 by Bishop Dubois. One of the highlights of Saint John Neumann's life was his participation, in Rome, in the Proclamation of the Dogma of our Blessed Mother's Immaculate Conception. Through his efforts, the Forty Hours Devotion was introduced in the Philadelphia Diocese. He founded the first church in America for Italian-speaking people. He also founded the Glen Riddle group of the Sisters of the Third Order of St. Francis. At 48 years of age, completely exhausted from all his apostolic endeavors, he collapsed in the street on January 5, 1860. He is buried beneath the altar of the lower Church in St. Peter's Church in Philadelphia. 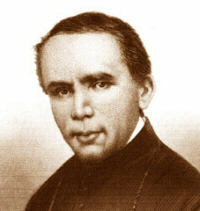 Read more about the life of St. John Neumann here. If you live close to Philadelphia or are passing through visit the Shrine of St. John Neumann. St. Telesphorus was Greek, probably from Calabria. He was the seventh Roman bishop in succession from the Apostles. He celebrated Easter on Sunday but maintained fellowship with communities that did not. He started the tradition of Christmas Midnight Mass, and decided that the Gloria should be sung. Some legends say he was a hermit before his election, and that he instituted the tradition of Lent, but these are doubtful. According to St. Irenaeus, he was "an illustrious martyr". His remains are interred in the Vatican.